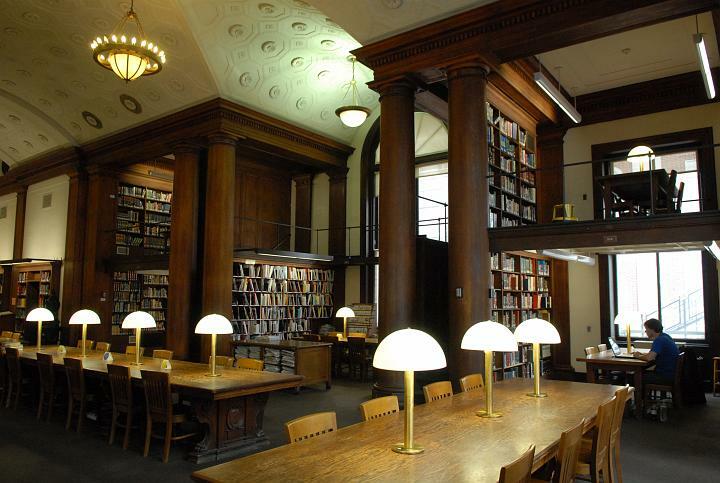 Please note that, in connection with an event, our reading room will close at 5:00 PM on Friday, September 25, 2015. The stacks will remain open as usual until 6:45 PM, and doors will close to non-participants at 7:00 PM. Also note that, in connection with preparations for the same event, the south-east alcove and part of the table under the stained glass window will be unavailable that same day from noon onward. Signs will be posted accordingly. We apologize for any inconvenience this may cause, and thank you for your cooperation. The library will be back to its normal schedule on Saturday. This entry was posted in Announcements on September 24, 2015 by Ria Koopmans-Debruijn. 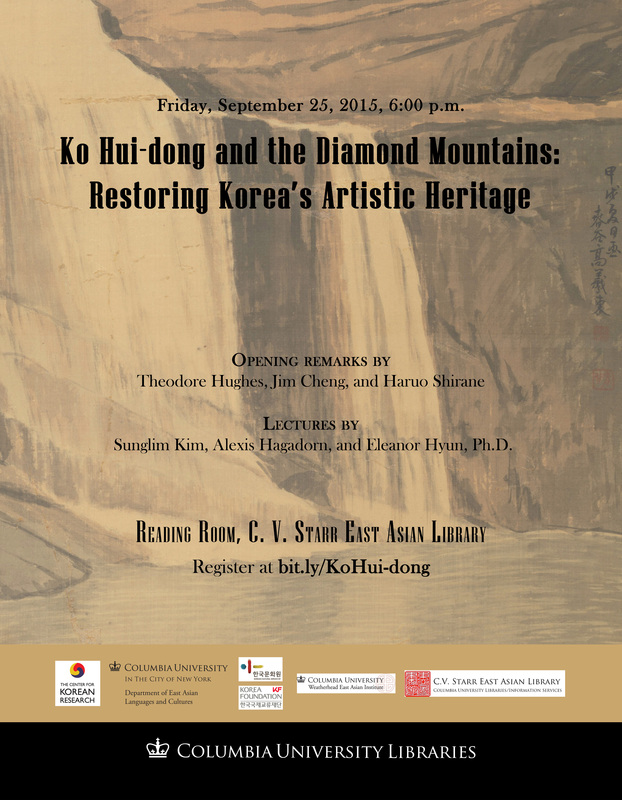 This Friday, September 25, 6:00-8:00 PM, we will have a special event in honor of the recent restoration of an important Korean painting in our collection, Cascading Waterfall in Mountains, by Ko Hui-dong. The event will take place in our reading room, and will include a number of brief lectures in addition to the unveiling of the restored painting. A small exhibition of books and other material about Ko Hui-dong is also on view. To attend this event, please register at bit.ly/KoHui-dong. We look forward to seeing you there. This entry was posted in East Asian Events, Exhibitions, Starr Treasures on September 22, 2015 by Ria Koopmans-Debruijn. This week, and into next week, we are offering orientation sessions for all our languages. Come and find out about all the wonderful resources we have available, learn the basics of identifying and using them, and get up to speed for your next research project or paper. No sign-up necessary. All sessions will be approximately one hour, and take place in our Kress Seminar Room. We also continue to offer 20-30 minute tours of our physical space. Please join us for any of the following dates and times, and learn to find your way around. No sign-up necessary. All tours start at the library’s front desk. This entry was posted in East Asian Events on September 14, 2015 by Ria Koopmans-Debruijn. Come master the maze that is Starr Library. We are offering 20-30 minute tours of our physical environment. Please join us for any of the following dates and times, and learn to find your way around. No sign-up necessary. All tours start at the library’s front desk. We will also offer orientation sessions for all our languages. Come and find out about all the wonderful resources we have available, learn the basics of identifying and using them, and get up to speed for your next research project or paper. No sign-up necessary. All sessions will be approximately one hour, and take place in our Kress Seminar Room. This entry was posted in East Asian Events on September 4, 2015 by Ria Koopmans-Debruijn. Another September, another academic year! A warm welcome from all of us at Starr Library to all new students, faculty, scholars and staff, and an equally warm welcome back to all ongoing students, faculty, scholars and staff. We look forward to another exciting year full of interesting activities, events, and challenges. Very shortly we will make our schedule of walk-in tours and orientation sessions available right here on this blog page, so stay posted! We hope many of you will attend, and we look forward to meeting and greeting you. This entry was posted in East Asian Events on September 3, 2015 by Ria Koopmans-Debruijn.